Limited to one-time use per product. 50% Bonus Coupon - Minimum Purchase RM50; Maximum Discount RM30. 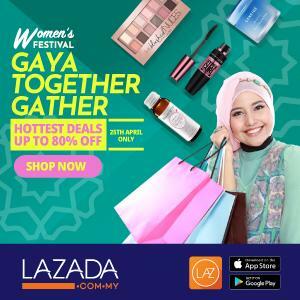 90% Bonus Coupon - Minimum Purchase RM50, Maximum Discount RM90. Coupon validity period: 1 days upon download. Category exclusions: (Gold bar, gold coins, silver bar, silver coins, physical voucher, mobile top up and others). Coupon valid for one-time use only. Maximum download 1 Coupon per ID. Coupon validity period: 11 April 2016. Coupon on first come first serve basis. Only 1 Coupon type (Shopping Cart Coupon / Bonus Coupon / Shipping Fee Coupon) can be used in a single transaction. Multiple uses of same Coupons in a single transaction is prohibited. 11street.my reserves the right to cancel any Coupons at our sole discretion, where a member uses more than 1 ID to download such Coupons. The above terms and conditions are supplemental to the 11street standard terms and conditions for members, which can be viewed here.